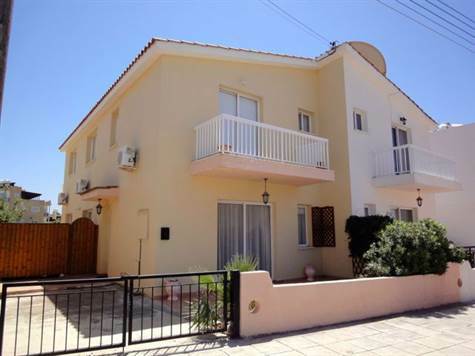 Yeroskipou, Paphos - This impressive 3 bedroom villa is located in the traditional village of Yeroskipou within easy walking distance to the village square. Paphos Town and the coast are a 5 minute drive away. The ground floor accommodation features a spacious open plan living room with comfortable lounge, formal dining area, large kitchen/diner, and guest cloakroom. The staircase is centrally located and has a useful storage cupboard below. Upstairs are three good size double size bedrooms, all with fitted wardrobes. A fitted cupboard on the landing provides further storage. The large master bedroom has an en-suite shower room, and there is a family bathroom accessed directly from the landing. Both the master and second bedroom have patio windows and balconies. There is lots of space outside with verandas to the front, side and rear of the property. Patio windows in the lounge provide easy access to the front veranda, and there is access directly from the kitchen to the rear. Whether you wish to lie back and relax in the jacuzzi or have a barbecue with friends, the outdoor space is ideal for enjoying the wonderful outdoor life. The swimming pool is located to one side of the property and is for use by the residents of the project. The property has lots to offer and is ideal as a permanent residence or as a holiday home. There are full title deeds. Please refer to MLS #:1347 when inquiring.